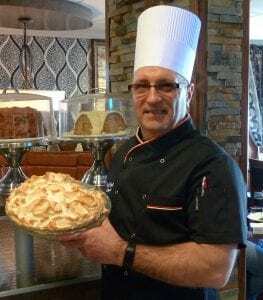 Meet Mario Poirier, Chef at Restaurant Chez Raymond in Neguac. Originally from Village St. Laurent, Mario had his first cooking experience at 16 years old, working as a cooks helper with his uncle Patrick Poirier, preparing meals for 65 workers at a paving company. Chez Raymond is a family restaurant that offers various types of cuisine, including Italian, Chinese, Acadian, Canadian and seafood dishes. Mario enjoys preparing seafood, specifically seafood chowder, although it’s a seasonal dish it’s in great demand during the summer months. And his favourite dishes on the menu to prepare are Coquilles St Jacques and Chinese combo plates. When it comes to buying local food, Mario always tries to use local ingredients especially in the summer months. “I buy oysters locally to support the local economy and also for the quality as it’s always fresh and that is most important,” he says. “It is the sense of accomplishment that I get when I prepare for big events such as Mother’s Day or catering for a wedding,” says Mario. “I ensure that everything is running smoothly and that everyone on my team is contributing, that we are on time and have enough food. Chez Raymond, when people comes from miles away to eat at this famous restaurant what does it say about it. From Saint John to Fairisle this is my first stop. Food is super good, workers are professionals and you’re bound to see friends you haven’t seen in a while. Keep the good work Chef Mario. See you soon Chez Raymond. Summer is here we’re coming. You are a great chef and the food is always good at Chez Raymond! Tu es un super chef et le manger est toujours bon ChezRaymond! Félicitations! Food always great at Chez Raymond , keep going Chef Mario , can’t beat your cooking ! Chez Raymond is our fav place to dine , especially the buffets !!! !❤️ Thank you for your many yrs of dedication.